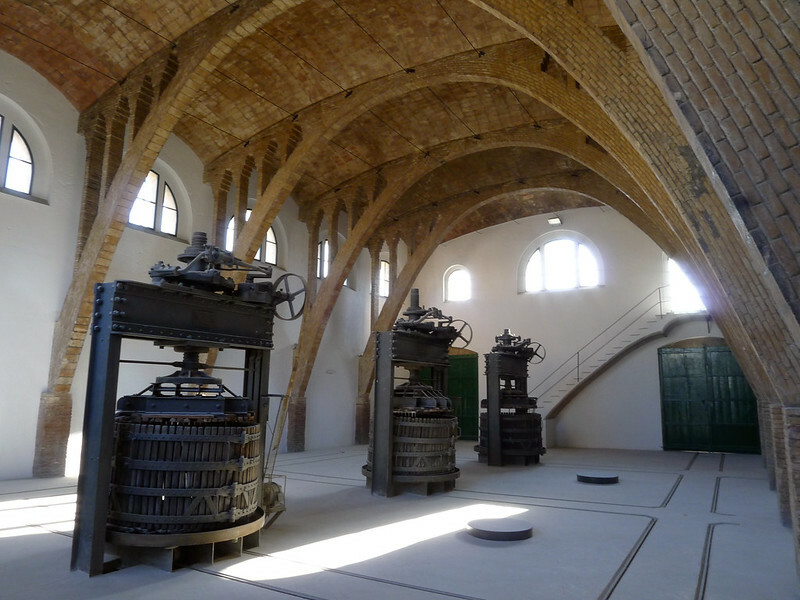 These eye-catching structures – originally dubbed ‘wine cathedrals’ – were the result, at the beginning of the 20th century, of a large number of small wine-growers needing to come together, following a period of over-production and the onset of the phylloxera vine disease, to form cooperatives for future production. The eight wineries, almost ecclesiastical in appearance, are notable examples of the Catalan form of Modernism. They were mainly the work of Cesar Martinell (1888-1973), a pupil of Gaudi, and form his main oeuvre; but one is the work of Pere Domènech i Roura (1881-1962), architect of the 1929 Barcelona stadium which accommodated the 1992 Olympics. So they are important as architecture. But in addition to their architectural distinction, the group represent a continuing example of working industrial premises, whose original designs have stood the test of time and are still fit for purpose. Their age and heavy usage, however, had made such demands on them that it was necessary for the Catalan government and a local wine foundation to join forces to undertake comprehensive renovations. These have been successfully carried out, and will ensure continuity of production of a commodity whose popularity shows no sign of diminishing.